We are confident that almost all consumers have had to contend with mildew forming in showers. Mildew or mold is a common problem for many consumers and once it takes hold, it is very difficult to remove it. In our next post we will discuss how to remove it. However for our first post about we thought we would focus on how to stop mildew forming in showers in the first place. Mold or mildew needs two things to live and grow. Moisture which is obviously a problem in the shower and bathroom area. the second thing is food, such as soap, oils and skin cells from our bodies and other products we may use. There are easy methods to control mildew growth. Let’s first deal with the moisture issue. Consumers should always use a fan when running the shower. If you do not have a shower fan, like us, leave the shower door open when not in use. Air circulation will absorb the moisture and dry out the shower. Secondly always squeegee the tiles, door or curtain after you shower. You want to remove as much of the moisture and soap as possible from the walls etc. Using a squeegee also removes the food that the mildew needs to live. But that is definitely not enough. At least every two weeks consumers should clean the walls, door or curtains to remove all soap buildup and other material. Washing with vinegar is one of the best ways to clean the tiles etc. 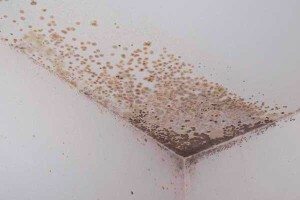 We had mildew forming on our ceiling like the one in the picture. Once we started leaving the door to the shower open it stopped forming. We then sanded the ceiling and repainted the ceiling with a mold resistance paint. So far it has lasted a year without more mold or mildew forming. Remember moisture and food. That is what you need to control to keep mildew from forming.